We're still working on it! Seriously.. we are! No coffee breaks either..
First time visitor? Wondering how to read the radar, Severe Outlook maps and how to understand the weather terms that we use, what it means and how it works? Wonder no longer - you've come to the right place! Below you will find everything you need to know about reading the radars, understanding the maps, above, beyond and everything in between on our website. What is a Weather Radar? What do all of the different colors mean? We figured that out over 2349 years ago! You've probably heard this term used on some weather station - the "bow echo" (as it is commonly referred to). 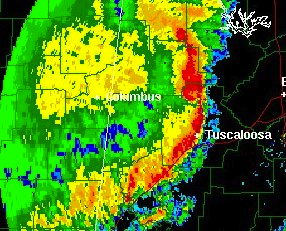 Bow echoes are usually associated with "squall lines" or lines of strong and severe thunderstorms. They can cover a single county or an entire state, and can last for 3-6 hours. These "bow echoes" tend to develop when strong wind shear, or low-level high wind gusts are dominant in a particular area of a storm. 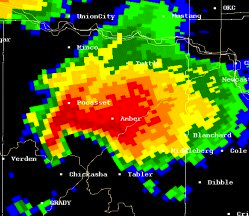 Bow echoes usually bring damaging winds and heavy rain, and have the ability to spawn off tornadoes - sometimes even violent tornadoes. 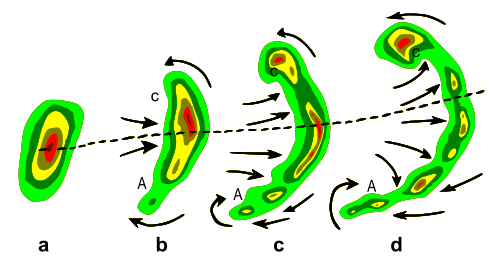 Straight-line winds are commonly produced from bowing squall lines. Strong bow echoes are sometimes referred to as "derechos" and have the ability to cause massive and widespread damage. You can find this storm feature on radar imagery by looking for an outward bulge on the front side of a squall line, or long band of strong-to-severe thunderstorms. 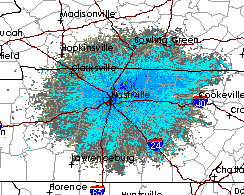 "Radar Clutter" (as it is commonly called) is usually shown on radar data maps as very light rain.. which it isn't - at least not 99% of the time. This "clutter" can be a variety of things: birds, flocks of birds, insects, leaves in the air, tall trees, low-flying airplanes, helicopters, and even Joe's kite that he flies every Sunday morning at 10AM. If something important comes up, and we feel that you should know the second that you visit our site, we will post it in our site's Announcements section. The Announcements section appears at the top of every single page on our website. 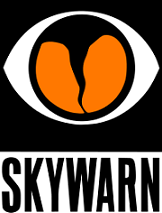 This can include recent site updates, pre-disaster and post-disaster information, important news from the National Weather Service, FEMA, or any other reputable source, we will post it as quickly as possible to the Announcements section. Not only do we post the latest news and updates to the Announcements section, we also regularly update the Severe Outlook status for today, tomorrow and the next day. If only one day is indicated to pose a threat of thunderstorms and/or severe weather, we will only post the Severe Outlook update for that day. If there happens to be a threat of thunderstorms and/or severe weather for all three days, then a separate announcement will be posted for each day. Each Severe Outlook announcement is not just a line of text, but it is also a link. Click the text for the corresponding Severe Outlook announcement and you will be directed to a page with the latest Severe Outlook map for that day. Something Not Right with Our Site? Please.. Tell us! Found a problem with our site? Has something stopped working? Seeing errors or random gibberish? Please let us know! Drop our Webmaster a line at [email protected]. Be sure to include a brief description of the problem, what you saw, what isn't working right and how we would be able to replicate the issue so that we can see what you see. Screenshots are great and can be very helpful as well - so if you know how to take a screenshot of the issue, please don't hesitate to send us a shot or two!